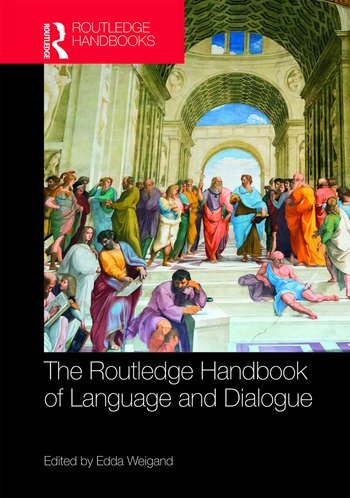 The Routledge Handbook of Language and Dialogue is the first comprehensive overview of the emerging and rapidly growing sub-discipline in linguistics, Language and Dialogue. Edited by one of the top scholars in the field, Edda Weigand, and comprising contributions written by a variety of likewise influential figures, the handbook aims to describe the history of modern linguistics as reasoned progress leading from de Saussure and the simplicity of artificial terms to the complexity of human action and behaviour, which is based on the integration of human abilities such as speaking, thinking, perceiving, and having emotions. The book is divided into three sections: the first focuses on the history of modern linguistics and related disciplines; the second part focuses on the core issues and open debates in the field of Language and Dialogue and introduces the arguments pro and contra certain positions; and the third section focuses on the three components that fundamentally affect language use: human nature, institutions, and culture. This handbook is the ideal resource for those interested in the relationship between Language and Dialogue, and will be of use to students and researchers in Linguistics and related fields such as Discourse Analysis, Cognitive Linguistics, and Communication. Edda Weigand is Professor Emeritus of Linguistics at the University of Münster, Germany. She is Honorary President and Founding Vice-President of the International Association for Dialogue Analysis (IADA, Bologna) and has been elected Assistant Secretary-General to the Committee of UNESCO’s Fédération Internationale des Langues et Littératures Modernes. She is chief editor of the journal Language and Dialogue and the Dialogue Studies series.